All vehicles must have a muffler or spark arrestor and have either a street-legal license or be registered as an off-highway vehicle. If you are not a resident of California and your OHV is not registered in your home state, you are required to have a California "Nonresident" OHV permit to legally operate your vehicle. All OHVs must have a mast and red or orange flag for visibility in the dunes. Vehicles operated at night must use both headlights and taillights. 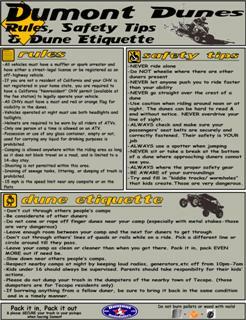 Helmets are required to be worn by all riders of ATVs. Only one person at a time is allowed on an ATV. Possession or use of any glass container, empty or not, used for carrying any liquid for drinking purposes is prohibited (43 CFR 8361.1-6). Camping is allowed anywhere within the riding area as long as it does not block travel on a road, and is limited to a 14-day stay. Shooting is not permitted within this area. Draining of sewage tanks, littering, or dumping of trash is prohibited. Do not burn pallets or wood with nails! PRIMA FACIE SPEED LIMIT: No motor vehicle shall exceed 15 mph within 50 feet of any campground, campsite, or concentration of people or animals (CVC 38310). SPEED, TURNING, RECKLESS DRIVING: You may not drive a motor vehicle in a manner that endangers the safety of other persons or their property (CVC 38305, 38314, 38316a, 38317). Call the Barstow Field Office at (760) 252-6000 for further information. Filming and race events are two differently organized activities. You will be referred to the proper BLM person based on the activity and area that you plan to use. Special permits are required for certain activities at Dumont. Competitive Events - including car and motorcycle racing and riding events. Product Testing - this includes launching drone aircraft, off-road testing of vehicles and other equipment. Musical Events - including concerts and bands. Vending - including the sale of food and products at competitive events or otherwise on BLM-managed land.